There’s something about walking into a room full of strangers that makes people nervous. ECO Canada hosted an event to help professionals build the skills required to network and feel comfortable in any business setting. Learn tips and practical advise that will help you network with ease. We kicked off 2018 with a busy schedule of events and have no intention of slowing down. 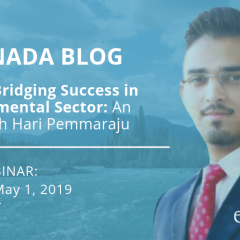 In our quest to meet with Environmental Professionals across Canada, we organized workshops, speakers, networking and webinars to hear from those working in the environmental sector and get some face time with our certified members.